Nicholas Nassim Taleb, author of The Black Swan book. Debt is fragile; equity can flex. A finance professor at New York University and a research scholar at Oxford, Taleb drew wide attention after the 2007 publication of The Black Swan: The Impact of the Highly Improbable, which warned that our institutions and risk models are not designed to account for rare and catastrophic events. Among other things, the book presciently cautioned that oversized and unaccountable banks using flawed investment models could trigger a financial crisis. He also warned that the government-sanctioned housing finance agencies, Fannie Mae and Freddie Mac, were sitting on a “barrel of dynamite.” One year after The Black Swan was published, Taleb’s predictions came to pass. Taleb doesn’t identify as a libertarian, but he often sounds like one. He supported Ron Paul in the 2012 presidential election and has cited the libertarian economist Friedrich Hayek as an influence. He has called New York Times columnist Thomas Friedman “vile and harmful,” and he coined the phrase “Stiglitz Syndrome” after Nobel Prize–winning economist Joseph Stiglitz, referring to the phenomenon of public intellectuals being held utterly unaccountable for their bad predictions. The economists Paul Krugman and Paul Samuelson are among Taleb’s other Nobelist bêtes noire. Taleb’s new book, Antifragile: Things that Gain with Disorder, argues that in order to create robust institutions we must allow them to build resilience through adversity. The essence of capitalism, he argues, is encouraging failure, not rewarding success. A student refused the professor's assignment to stomp on the name of Jesus. The student did not initiate controversy over Jesus; the professor did. Debate? Accept differences? No. This is a university. Florida Atlantic University suspended the student from the class. Then apologized. Then FAU brought academic charges against the student. PJ Tatler has the full story. The new leaders of Venezuela are trying to get one last reprieve, but they are desparate. The collector is coming in the door. Hugo Chavez ruined his oil-rich country to solidify his power at home and to broaden it to other Latin American countries. He gave away oil to buy influence. Then he fired almost all the technical experts at the PdVSA, the national oil company - and expected to maintain the level of oil consumption. He strangled the private sector, including food distribution. Then when prices climbed he required price controls, which led to food shortages (always does). And he also caused shortage of medicine. The bill came due so he extended his credit lines and his countries problems. Now the collector has is coming inside. The government is providing dollars to selected businesses so they can import food and medicine. But that is like working on the roof while the building is falling due to structural failure. He is quoting FT: “The total supply of foreign exchange to the economy via Cadivi [old system for getting foreign currency] and Sicad [the new system] is still likely to undershoot the overall demand in the economy for dollars,” [Goldman Sacs economist Alberto] Ramos said. He said to control the black market Caracas must fix underlying problems including high inflation, an unfriendly business climate, a misaligned currency, and exacerbated political and economic risk. Meade further observes about this failure of socialism. Venezuela’s economic woes are telling. Apologists for Chavez mentor Fidel Castro blame Cuba’s sixty years of economic problems on the US embargo. If it weren’t for Uncle Sam, they say, Castro would have built a socialist paradise by now. Venezuela is the test for this talking point. Not only is there no US embargo in Venezuela, but the country also has huge oil reserves. And what does it have? Food and medicine and foreign currency shortages. A socialist paradise, indeed. 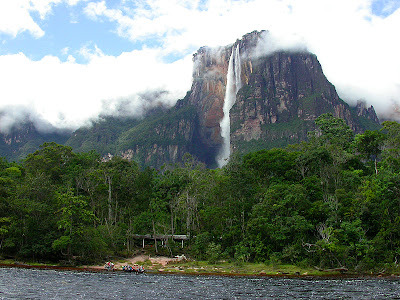 The photo: Angel Falls in Venezuela. How does a waterfall form at the top of a mountain? Actually it is a large, flat plateau; must be wet. Source BeautifulPlacesToVisit.com; they don't credit it. Little irritants shouldn't stop peace between Israel, the Palestinian Authority and the government of Gaza. Obama has an example: rockets coming through the roof and killing kids in their sleep. Obama was holding a press conference with Mahmoud Abbas in Ramallah, West Bank. The Wall Street Journal has the full transcript. So I think it’s important for us to work through this process, even if there are irritants on both sides. The Israelis have concerns about rockets flying into their cities last night. And it would be easy for them to say, you see, this is why we can’t have peace because we can’t afford to have our kids in beds sleeping and suddenly a rocket comes through the roof. But my argument is even though both sides may have areas of strong disagreement, may be engaging in activities that the other side considers to be a breach of good faith, we have to push through those things to try to get to an agreement — because if we get an agreement then it will be very clear what the nature of that agreement is: There will be a sovereign Palestinian state, a sovereign Jewish State of Israel. And he continued by comparing the people who shoot rockets at civilian housing to having Canada on our border! And those two states I think will be able to deal with each other the same way all states do. I mean, the United States and Canada has arguments once in a while, but they’re not the nature of arguments that can’t be solved diplomatically. And I think we can keep pushing through some of these problems and make sure that we don’t use them as an excuse not to do anything. Now they can tell us the damage Obamacare is causing. The government-controlled press was not allowed to report on the damage Obamacare would do. That is, what could be clearly seen on March 23, 2010 that would have side effects. Not just side effects, but damage clearly intended by Nancy Pelosi, Harry Reid and the other architects of Obamacare. Not allowed to report? Well, they didn't report what could then be seen. But now the New York Times can report on a small business watching the huge, speeding Obamacare about to hit it. Option One is to provide the insurance. According to the law, Ms. Shein will have to offer health insurance or, most likely, pay a penalty, and she estimates the insurance will cost up to $108,000 a year for 90 employees (managers have insurance already). This is just an estimate, she said, because the insurance companies have not yet created and set a price on plans that meet the law’s requirement for minimum care. She estimates a cost of $200 per employee a month, of which the bakery would pay half and the employee would pay half. Employees can choose not to participate in the plan if they are covered elsewhere or for other reasons, so it is unlikely they will all sign up. Option Two is to not offer health insurance and let employees find coverage elsewhere, perhaps on one of the new government exchanges. Under this option, the company will probably have to pay the mandated “employer shared responsibility payment” to the government. The cost to the business would be $2,000 per employee a year, but the law exempts the first 30 employees, so the total would be $130,000 per year for a 95-person company. One benefit of this option is that the company would not have to take on the burden or expense of managing the insurance plan, which Ms. Shein estimates would take $10,000 of staff time. One way to cover the costs associated with the new law would be to raise the price of each item sold about 4 percent and pass the costs along to buyers. “It’s ironic that our success meant we could grow,” Ms. Shein said, “and now we will be competing against smaller companies, with 50 employees or fewer, who will be able to charge less per item because they don’t have the financial burden of health insurance.” Prices are currently similar among local competitors, Ms. Shein said, and she says she believes the increase in her prices could affect her sales, possibly significantly. It is important for Ms. Shein to make a decision soon on staff levels because the number of full-time employees a business has in 2013 will determine its status in 2014. If the business has 50 or more full-time, or full-time equivalent, employees, it has to provide insurance to any staff members who work 30 hours or more a week. But… but… Obama said everything would be better if we allowed him to control everything! Not everything, just our health care. Obamacare is hurting right now. Businesses are cutting employees to get below 50 employees. Some are cutting full-time employees to below 30 hours to avoid Obama. Via Commentary Magazine's Contentions blog. One of the most remarkable life stores I have ever heard: Edwin Ramsey was a lieutenant in the US Army stationed in the Philippine Islands when Japan attacked the US at Pearl Harbor. When Japan attacked the PIs he surprisingly led a cavalry charge that helped hold off the attackers for a critical length of time. He would have been swept up in the Bataan Death March, but he and a few others managed to cross the road being used without being captured. He went into the underground. The Japanese focused on knocking off the ranking officers in the underground and succeeded, leaving Ramsey one of very few junior officers. He organized more and more people until he was over 40,000 people. The Army sent people ashore to maintain contact and got a radio to Ramsey, so he had contact with General MacArthur. He even traveled to another island - if I recall correctly - by submarine. This went on for over three years - without being captured. He was promoted during the Philippine occupation, by radio! He continued to coordinate with MacArthur until his return to Luzon in January, 1945. (He arrived at other Leyte Island earlier.) Wikipedia In June, 1945 Gen. MacArthur awarded him - then a Lt. Colonel - the Distinguished Service Cross. After the war ended Ramsey went to law school then represented Hughes Aircraft in Japan, then formed his own companies in Taiwan and the PI. He retired in Los Angeles. He passed away March 7, 2012 at age 95. Congressional Budget Office says Obama's tax increases won't cause long-term improvement in the US's budget situation. To control any budget you have to control spending. That's a "Duh!" to you and me but unthinkable in D.C. The Emperor would not take a bite of food at a luncheon this week because his personal taster was not present. Emperor Obama could not accept that mere mortals like US Senator Susan Collins of Maine were eating the food. He had to have his personal taster. So there, knaves. You thought you elected a president who would serve you. You elected The Emperor! In order to tell throw more money to his friends and donors who have become energy researchers and investors, Emperor Obama had to fly to Chicago and back in a huge Boeing 747. His flight cost as much as … how many weeks of White House tours for school children? And how many pounds/tons of CO2 did he dump into the atmosphere? Don't underestimate the creativity of Senator Patty Murray. She was given the huge responsibility of chairing the Senate Budget Committee and writing the FY 2014 budget. She cuts spending by $975 billion and talks it up. Look! I cut speeding!!! But she fails to mention that her budget also increases spending by $960 billion to replace the sequester cuts and $100 billion in stimulus. $960B plus $100B = $1,060B or $1.06 trillion. Where I am from $1,060B is greater than $975B and this is an INCREASE in spending of $85 billion. That is not a cut. Furthermore, where will her famous cuts be? And what will they be? People who have read it say that in 114 pages she doesn't get there. Ezra Klein at Washington Post. In the “Reducing Health Costs Responsibly” section, for instance, the Senate Democrats’ budget says, “first and foremost, the Senate Budget rejects the approach taken by House Republicans when it comes to cuts to health care.” Fair enough. But it never really says, with any specificity, what Senate Democrats will do. The budget speaks of “$275 billion in savings by further realigning incentives throughout the system, cutting waste and fraud, and seeking greater engagement across the health care system,” but at no point across its 114 pages does it name these savings. There’s talk of building on the Affordable Care Act’s efforts, but few specifics. She is afraid if she told you what she would cut you would get defensive about the cuts that affect you. True. But some adult has to take charge and provide some leadership. Obama's Sec of Education claimed that his 2013 sequestration would cause the layoff of up to 40,000 teachers. ... as many as 40,000 teachers could lose their jobs. ... There are literally teachers now who are getting pink slips. Where? He was asked. He was silent for days then proudly announced one county in West Va had put 100 teachers on notice. First. Tens of thousands was only 100!? The Wash Post fact checker gave Duncan 4 Pinocchios. Second. It stunk so bad that the Wash Post sent a reporter who found no one concerned w the effects of Obama's sequester. The truth was the notices had to do with increasing service to special Ed kids and caused internal transfers not loss of jobs. Which to believe? Actions speak louder than words. Photo: Colt AR-15 from Wiki Commons. Click to enlarge. Pension reform is in the game in the WA Legislature. WPC has some ideas; see the bullet points below. We expect a 25-year total employer savings of $436 million as a result of this bill. We expect a long-term savings because employers would contribute less to the PESP than they would, under current law, to a DB [Defined Benefit] plan for the affected members. Employers, and members remaining in the DB plans, are expected to contribute higher contribution rates than we assume under current law. The estimated savings for just the 2017-19 biennium is $38 million. The legislature recognizes the need for public employees, public safety employees, teachers, and school employees, to have a secure and viable retirement benefit, not only for their own financial protection, but also so that public funds are spent prudently for their intended purpose. The legislature also recognizes the need for public employers and taxpayers to have consistent and predictable pension funding obligations in support of employee retirement benefits. Therefore, it is the intent of the legislature to provide a defined contribution retirement plan option for new public employees, teachers, and school employees that uses best practices of defined contribution plans to provide opportunity and flexibility to accrue a viable retirement benefit, while providing stable funding requirements for public employers and taxpayers. To accomplish this goal the bill would provide state employees who are currently in the state’s open defined benefit pension plan (Plan 2) and the hybrid defined benefit/defined contribution plan (Plan 3), as well as new hires, the option of enrolling in the new defined contribution plan. The state’s most costly defined benefit plan (the one with the billions in unfunded liabilities) was closed to new enrollees in 1977. Although the Legislature has little say over state employee collective bargaining agreements negotiated in secret with the Governor that determine compensation levels (other than a simple “yes” or “no” vote), pension policy is explicitly exempted from union negotiations and is set directly by lawmakers. While the Legislature maintains this authority, there are legal restrictions which limit the type of changes that can be made. A 1956 State Supreme Court ruling (the Bakenhus case) found that a pension promise is a contractual right. This makes changes for existing employee plans at risk of a lawsuit. By making the new defined contribution pension plan optional for current state employees, SB 5851 avoids implicating this Court decision. Obviously no contractual right exists for future state employees, so offering only the new defined contribution plan to new hires as a retirement benefit is well within the authority of the Legislature. For future pension benefits, Washington should transition to a defined contribution plan, as proposed by SB 5851. These plans are now common in the private sector because they provide a retirement benefit for employees while helping companies accurately project future pension costs. Employees in such plans are not forced to rely on political conditions that might change in the future. It is important to maintain diligence on the state’s existing pension obligations while pursuing additional reforms. Part of what has contributed to the state’s unfunded pension liability is legislators and the governor not making the required contributions over the past decade so that lawmakers could spend that money on other programs. Washington’s multibillion-dollar pension problem was not created overnight, so it will take time to eliminate these unfunded liabilities. Starting these reforms will require the conviction to do what is in the best interest of all citizens and state workers, not just narrow special interests. Moving to a defined contribution pension option as proposed by SB 5851 would be a step in right direction. While it should remain optional for current employees, the new defined contribution plan should be the only pension option offered to new hires, so the state’s remaining defined benefit plans are closed, and the burden of their financial liability on taxpayers gradually reduced. Any savings realized by adopting SB 5851 should be used to pay down the state’s multi-billion dollar unfunded pension liability, so there isn’t the temptation for lawmakers to increase state spending elsewhere in the budget. Dr. Coburn sent the following letter to HUD Director Shaun Donovan urging the agency to rein in cases of fraud and neglect across the country before cutting vital service for those in need. There are currently 4,000 PHA’s across the country receiving over $24 billion in federal aid. Over 700 of these PHA’s were scored just last year by HUD as having substandard management or finances, and the Inspector General identified $8.7 billion in HUD funds that could have been better spent to meet the agency’s goals. However, HUD only redirected $1.5 million. Follow the link and read the letter. President Obama's HUD has made a mess of public housing and isn't using the money it already has to fix things. Washington public pensions are at risk. There are several; a few appear to be safe, but others not at all. Washington is above average among the states, but that's like getting a D grade when half the class flunks. The Seattle Times dug in and did their own analysis. They found a shortfall of $31.1 billion, that's $31,100 million. But that may not be good enough. An analysis by The Seattle Times suggests that the system’s promised benefits are much bigger, and its real assets smaller, than official numbers indicate. The analysis, using market-based data and methods, pegs the total gap between the present-day value of future benefits and assets on hand at more than $31 billion. By that measure — one advocated by many outside experts and economists — the system’s nine major defined-benefit plans together have only about 64 cents in assets for every dollar of liabilities, rather than being 100 percent funded as the official figures indicate. State officials defend the current way of valuing the pension system’s assets and obligations, saying it’s the industry standard. But the pension industry, prodded by regulators and bond-rating agencies, is slowly moving toward a market-based approach — treating pension promises much like state debt, and recognizing changes in the market value of pension assets immediately rather than smoothing them out over several years. Matt Smith, the state actuary for the past decade, explains that this stream of future payments has to be converted, or “discounted,” back into present-day dollars before it can be sized up against the plan’s assets. The trick is picking the most appropriate discount rate; the bigger the rate, the smaller all those future obligations look in today’s dollars. If the plan’s discounted liabilities are bigger than its assets, the plan is underfunded. Indeed, a recent report from the Pew Center on the States, using 2010 data, found Washington’s pension system was the fourth-healthiest in the nation. But a growing number of economists, academics and outside pension experts say the standard approach is fundamentally flawed. Most plans, they say, use discount rates that are too high, making the present-day value of their pension promises look smaller than they really are. “I’ve seen people get so red-faced about this issue,” said Alicia Munnell, director of the Center for Retirement Research at Boston College. Public pensions such as Washington’s operate under special accounting rules, one of which allows them to assume a long-term rate of return on their investments. Most plans have picked a rate between 7 and 8 percent; all but one of Washington’s plans assume 7.9 percent. That assumed return is significant, because another special rule lets public plans use it as their discount rate — something corporate pension plans were forced to abandon nearly two decades ago. Critics such as Munnell and Biggs say this rule ignores the fact that pension benefits are effectively almost as guaranteed as state bonds. That, they say, means they should be valued similarly to bonds. • Last year Indiana’s public pension fund became the nation’s first to drop its assumed rate of return — and hence its discount rate — below 7 percent, citing low bond yields and volatile stock markets. • Moody’s, one of the three big bond-rating agencies, is considering changing the way it analyzes state pension plans. Its proposed new method, which would use market values of assets and a discount rate based on an index of high-grade corporate bonds, would nearly triple the total unfunded liability of the nation’s state and local pensions, from $766 billion to $2.2 trillion. • Even the Government Accounting Standards Board, which sets rules for public pension plans and has long defended the actuarial approach, is changing its tune. Under new rules the board issued last year, underfunded plans will have to start discounting their “excess” liabilities using municipal-bond rates. $31.1 billion short. We are headed for, no, already in trouble. We have to put more into the current plans and consider options for the future. Sea Times Editorial with graphic. Ladies, women, girls…. Parents, you will want to keep your daughters out of Phoenix, Arizona. Mayor Greg Stanton and the city council voted to allow any man who thinks he is a woman to use ladies bathrooms. Any man!! What could possible go wrong? Of course they called it the anti-bias bill and insist they are just trying to join the bandwagon. Build renewable energy sources - that is, hydroelectric, biomass, solar or wind power. We hear it over and over. But do what they tell you to and they fight you tooth and nail. If you want to build wind farms you build them where the wind blows. But it makes no sense until you get the electric power to where people need it. 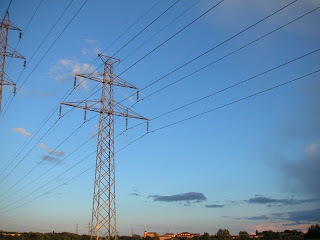 So you have build transmission lines. Because of your evil desire the Audubon Society and Oregon Desert Society file suit to stop you. And they really want to stop your renewable power project. What did you do wrong? You believed the greenies when their lips were moving. So it appears. Photo: Source forgotten. In Indiana, as I recall. Click to enlarge. I haven't been a member of the Mountaineers since the mid 1960s. But when I was I went to the most unique ski area in Washington. I don't know that there is a second place. Meany Lodge was built by the Northen Pacific railroad tracks and was served by passenger trains. There is road access in the summer, but not the winter. But the pax service was stopped in 1960. So they improvised. A road was (now anyway) less than 3 miles away. They used - and still do - a snow cat trailing two ropes to haul the skiers. You put your pack in the snow cat. Then you get behind and grab the rope. And hope you won't be the first to fall off. I went there once either in high school or college. Quite an experience. Also because the lift is a gasoline-powered rope tow. If you have never "ridden" a rope tow you have missed another experience. Meany Lodge is still there. 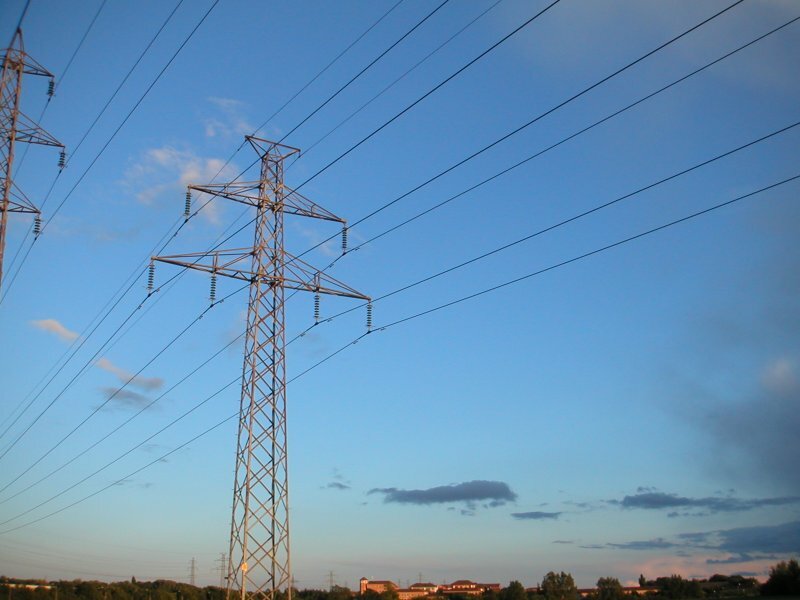 The change that puts it in the news is that the rope lift has to be converted to electric power. And - I didn't know it/see it - the gas power is a very old Chevy truck, chassis and all. Tacoma News Tribune - Also describes the fun of riding a rope tow. Before dictator Hugo Chavez died his apparent successor Nicolas Maduro was talking about him in the past tense hours before they announced his death. Fausta's blog Follow down to 1:17 PM. She says Maduro spouts all the standard propaganda, but without Chavez's charm. Hat tip to Jim Miller. The Puget Sound area is a wonderland for shorebirds during winter and the spring and autumn migration. Tens of thousands spend the winter or stop by for days or weeks along their route. Dunlins, snow geese, brants, surf scoters, golden eyes… and more. Lynda Mapes in Seattle Times features Port Susan, where the Stillaguamish River hits salt water. So important is Port Susan Bay as habitat for these shorebirds, that the Greater Stillaguamish Delta, of which it is a part, and the Greater Skagit Delta next door to the north, have just been named a site of regional importance in the Western Hemisphere Shorebird Reserve Network. The only one in Puget Sound, the designation recognizes that the Greater Stilly and Skagit Delta — which the birds use as one connected habitat — is an important stopover and wintering ground for more than 20,000 shorebirds a year. Any birder will tell you that’s a conservative estimate. 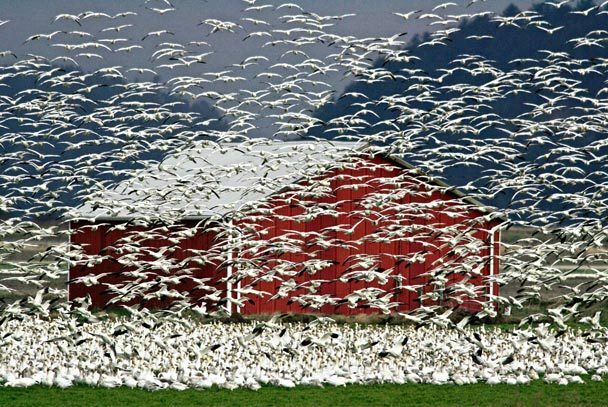 The area routinely hosts tens of thousands of shorebirds here, arriving in living ribbons of flight. On a recent morning the Dunlins’ flight, so beautiful to us, was all business for them. Eat or be eaten: That was the agenda. 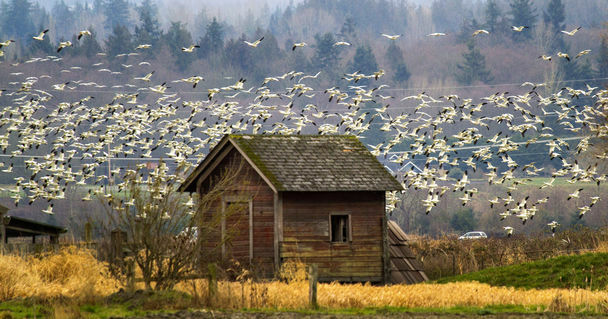 “That’s over-ocean flight; they will do that for hours,” Milner said, watching the Dunlins sweep back and forth over Port Susan Bay. The Nature Conservancy of Washington has just completed a restoration project to make its more than 4,000-acre Port Susan Bay Preserve even better. The $4 million project restored 150 acres of tidelands by taking out a 1.4-mile dike and replacing it with a smaller one, set farther back toward the land. Today the Stilly and Skagit deltas together comprise more than 90,000 acres of tidally influenced marine and coastal wetlands that shorebirds depend on. North of Port Susan Bay, at Big Ditch, as the preserve owned by the Department of Fish and Wildlife on the Skagit Delta is known, the importance of these lands for other wildlife, too, was soon obvious. We have become fans of the Skagit River delta the past few years. 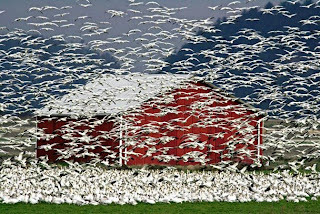 Economic Freedom We see clouds of snow geese on every winter trip. Also Seattle Times Field Notes Blog. The photos: Seattle Times. Second one by Mike McQuade. Click to enlarge. James Hansen's underwear showing has been noticed by the NY Times! Now his friends are saying he is tilting at wind mills in fighting the Keystone XL pipeline. And using or misusing his government position to do so. Harry C. Alford, Leader of Black Chamber of Commerce, says Obama “made a fool out of me.” He complains that Obama is campaigning instead of doing his job. Alford also called out Barack Obama’s inattention to the national budget. The president has yet to submit a budget on time, and has not had a budget passed in more than 1,400 days. Watch the interview at the link. CBO projects revenue to be $2.7 trillion for FY 2013. This would beat the pre-recession highest-ever $2.6 T of 2007. If we have a budget problem it is more a spending problem than a revenue problem. "I am not a dictator," says President Obama. Are you assured? But where is the proposal Obama is offering? The only thing I see is his painting the worst scenarios of effects of the sequestration and saying the Republicans won't compromise with him. Show us your proposal, Mr. President. He also seems to be unaware that Harry Reid's Democrats control the Senate. 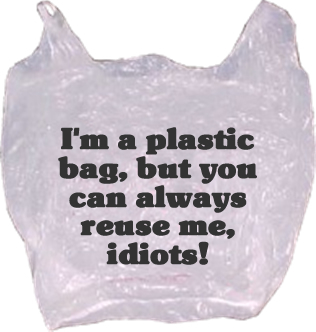 Plastic-bag ban causes more shoplifting? When the Seattle City council banned plastic grocery bags and required stores to charge for paper bags the world became a better place. What could possibly go wrong? When you tell shoppers to bring their own bags they walk around the store carrying a place to hide things. Grocery Outlet in Lake City has suffered greatly increased shoplifting. Starting with the plastic-bag ban. ADDED: Did the ban cause the increase? We don't know yet. This store says the timing fits and has a believable scenario.